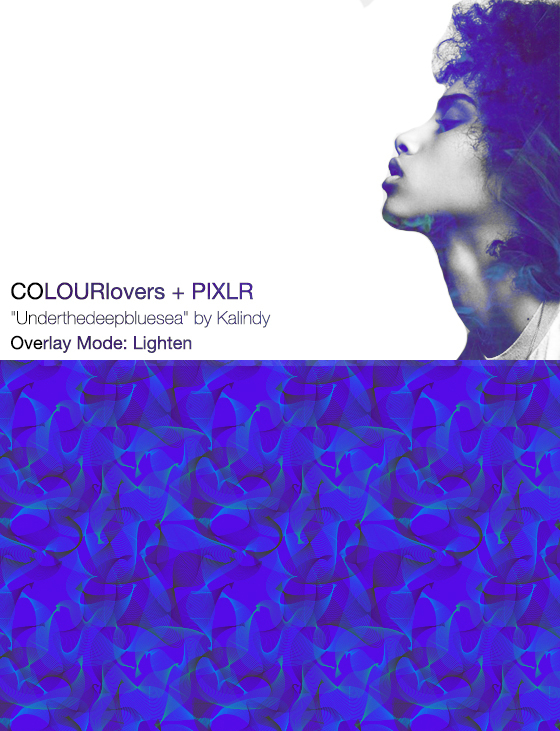 Meet the New COLOURlovers Overlays Pack on Pixlr! They're here! 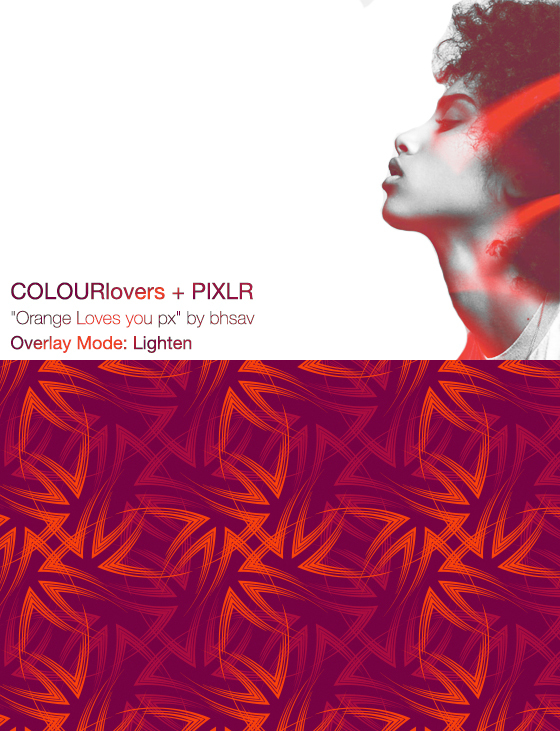 Meet the latest design pack on Pixlr web and mobile apps - The COLOURlovers Expansion Pack! 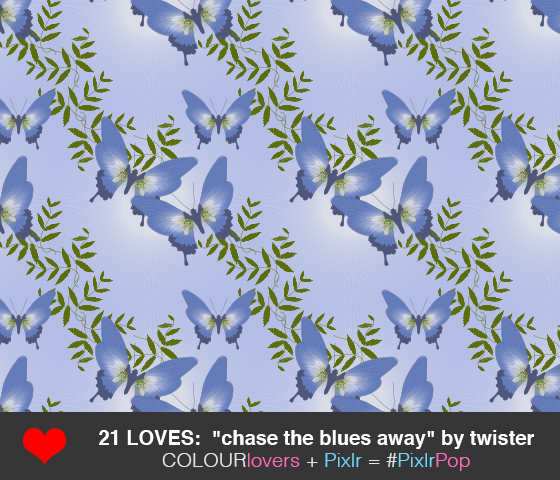 These design ideas were the result of our awesome, COLOURlovers + Pixlr #PixlrPop Contest held at the end of May. The result was eight (8) winning entries that went to inspiration for what is referred to as, Expansion Pack Overlays on Pixlr web, desktop and mobile apps. Overlay packs generally feature unique artwork set to varied styled effects similar to those in design programs (i.e. Photoshop). This means that some of the artwork is set to modes such as: Lighten, Multiply, Soft Light, Hard Light and so on. This changes their interaction with the artwork you use. Here is a quick example how you can use the COLOURlovers Overlays Expansion Pack with a clean portrait to create a trendy double exposure artwork. 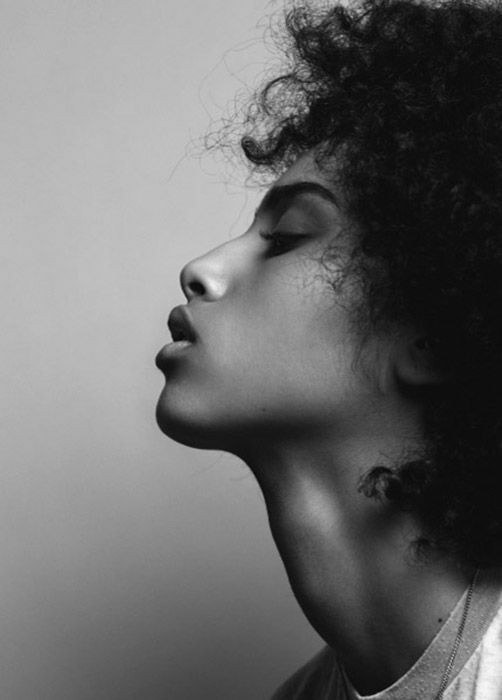 I used this beautiful black and white portrait (via Pinterest search, "Portraits") for the example images. I highly recommend fiddling around with a clean black and white portrait when designing double exposure and/or overlay types. As you can see these turned out pretty neat! Each style has a specific personality that really creates some terrific effects. Check it out for yourself! 2. Load your own image, or go find an easy portrait to work with, the one I used is at this link. (hint: right click + "open image in a new tab" works great to not grab the page link, instead you just want the link to the image itself. 3. You'll see the little COLOURlovers icon and you can start editing! Would you like a video tutorial? Let me know! The Maasai are one of the most well known Indigenous people of Africa. Their colorful attire and unique customs highlight their vibrant culture located in Southern Kenya and Northern Tanzania. Have you ever wondered as to the symbolism and social meanings behind their vibrantly beadwork? I am really impressed that the Maasai Culture still exits in our world today. With their unwavering culturally-rich history, American culture pales in comparison with our ever-changing fashion trends and cultural whims. They definitely have a deeply rooted culture one can't help but be impressed by. The illustrative world of Botany is so intriguing. Aside from the scientific points, you can learn so much in color use, shape and form and line work. It gets you to pay attention to the fine details of design rather than just the overall idea of say, a flower. Today I've got a video that follows a botanical design from start to finish. In this video I showcase how you can utilize blending, shading, outlining and a few tricks altogether. Would you find it valuable for me to make an entire video on making shading and blending elements such as these? The more complex shape, Shade - Hatching (above), is a series of squeezed dew-drop shape (found under the Sky Shapes category), then I used a stretched and modified crescent shape (same category) to round out the base. You can create any number of shading and blending custom shapes. I find it useful to create ones with longer lines, shorter lines, longer in width, curved bases (curved bases help streamline elements for floral designs). Having them on hand really cuts down on time when you want to be artistic and not spend all your time making the shading pieces at the same time. 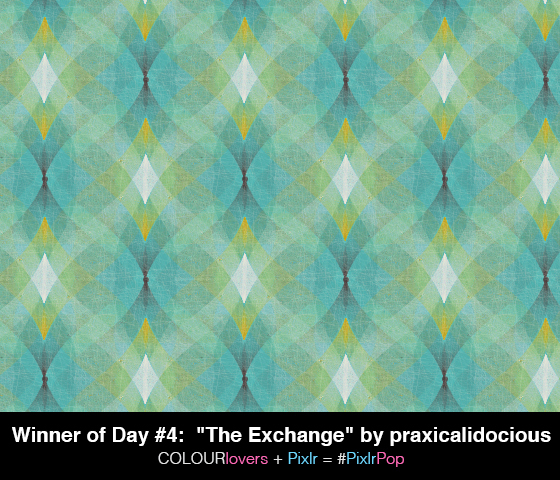 While you can peruse the shapes and patterns all over COLOURlovers.com, that's good for practice but copying work for practice will not allow you to create your own sense of style and imagination. Instead, after giving a little practice a go... knowing where to look for ideas is key. Anatomic Illustration is really quite interesting because it generally pieces off organic matter such as flowers, plants, insects, etc. and definitively shows nice line and color work enough for you to turn those art pieces in to a Seamless Lite pattern design in your own reflection. * Start with a main element of interest (or create vines and work on the seamless connections - this falls under the "stripes" type of patterns). * Connect it with some type of line-work such as vines or decorated lines (add bubbles, triangles, etc along the line like dew-drops on a vine). 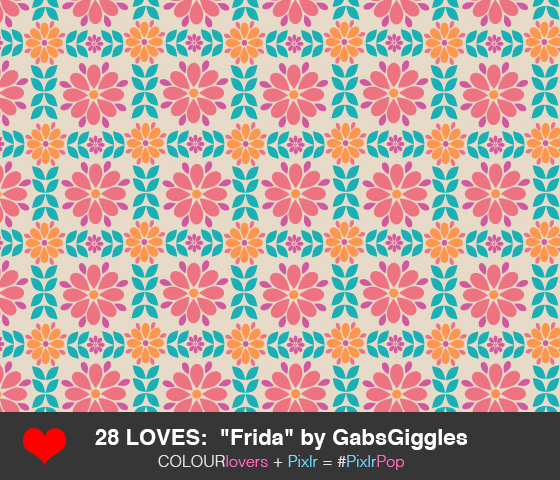 See many more great flower designs! I basically set the search results on CL to "flower" under the dropdown, Shapes option. Zentangle has been trending for some years now and many people choose to "tangle" for meditation and relaxation, just as most COLOURlovers utilize the palette and pattern tools on the site as a way of relaxing and meditating. 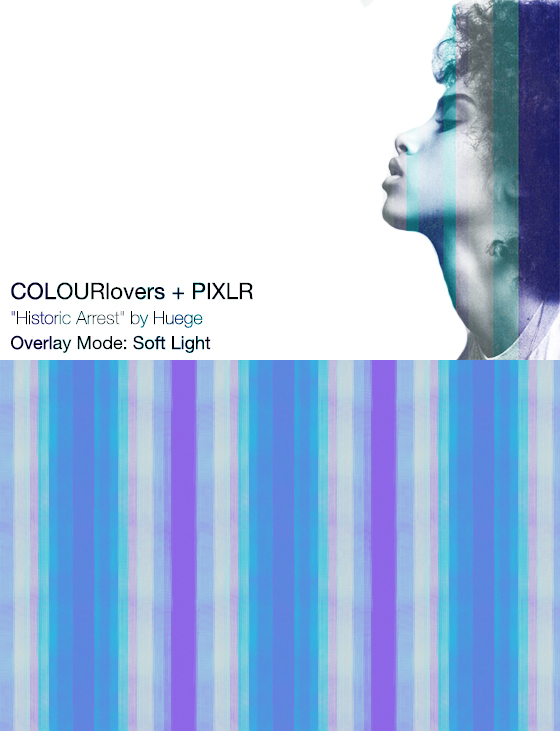 What I see a lot on COLOURlovers.com is that many people shy far away from using Seamless Lite after dabbling for a few, deeming it way too difficult to master. Mostly, and this is just my opinion, but well mostly because they compare themselves to the crazy-good pattern designs by veteran citizens of COLOURlovers. Here's the news people... yes, yes these kind-hearted artists are totally talented. But did it just happen that they opened up Seamless Lite and were Michelangelo in a day? No, of course not! So you'd be silly to think,"I'm Presto Perfect!" after 5-minutes or even 5-hours fiddling with Seamless Lite. Seamless is actually pretty easy to use, once you learn the ropes (if you are new here and need an in-depth intro to Seamless, see a video here on our YouTube Channel). Drawing shapes and putting together repeat-patterns is totally an aspect of digital Zentangle without the complications of learning (or purchasing) design software such as Adobe Illustrator or Photoshop. Seamless is simple and to the point, not to mention it comes with an entire supportive and artistic community you can share your work with. Remember, Zentangle is a personal art form. It does not have to be perfect. While you can achieve a more precise line-work by using this digital method of Seamless Lite, Zentangle is traditionally a hand-drawn technique, so take that in to consideration before you go all OCD on connecting points, center points and alignment. Let's get started with making a shape, something short and easy... then I will be going over using a grid to help you get a sense of space, alignment and design direction with your templates.... then we will continue to work on shapes and more. I find that making your own base layer grid and then saving it as a shape to re-use can greatly help line things up a bit more precise. Note: After making the next two video's, I felt that making a video specifically for Grids would be a good idea. The next video semi-introduces making a grid as well. I want to show you how to now reuse the grid shape you should have created if you'd followed the last video (above) and to develop a new pattern form with the grid as a guide. Never used Seamless Lite Before? Get up to speed! Just a reminder, if you have no idea what I am doing in some of these area's of using Seamless Lite, you can watch the video introduction on this at your leisure HERE. This covers a complete anatomy of the web application itself and is a more in-depth tutorial with voice-over (not a high-speed musical). 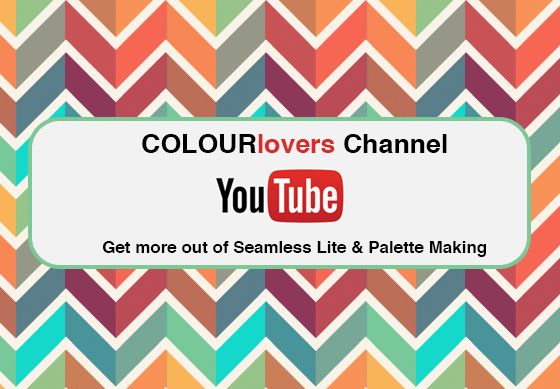 If you absolutely cannot wait until next week, I will be working on and uploading these video's over the weekend to our COLOURlovers YouTube Channel, join me there to get a jumpstart! Is there something you are wanting me to cover, but haven't seen it yet? Please comment to put in a request. I'm more than happy to accommodate. Tie-Dye, a modern textile craft, is something that has been around for ages and will be around for many more moons to come. Always intriguing, always a new spin off the same basic concept, done in a rainbow of hues to monochromatic intrigues. And while we're on the topic, check out the Rainbow Contest over at Instrucables right now (awesome art prizes). All types of submissions are acceptable, so have some fun with it! Tie-Dye became popular in the United States of our more modern world in the late 1960's and heavily saturated the 1970's which sort of branded it to the times and people of "Free Love", tripping on Acid and LSD. Tie-Dye mostly went in to hiding with the outrageously new Neon trends during the 80's and 90's. Then, along with every popular known trend of each era, it was brought back and re-hashed in our Pop Culture of today's fashion sphere. If you don't know what modern, American Tie-dye is, you might be living under a rock, but here is a great resource on the technique and style if you've never looked it up. So how did it literally become an American craft to be readily found in stores everywhere - I love this part. Basically, Tie-Dye came about when a company was trying to save it's brand. RIT® dye, at the time was losing momentum with their prime market clientele, older generation females doing home-dying. "At the time, RIT® dye was starting to lose it's market; primarily older women that dyed home goods." - Dharma Article, Did you Know...? Without getting in to too much detail on the actual specifics because I think that [ one of my favorite online dye resources ] the Dharma Trading Company impressively covered the textbook attributes of this really well in their article, Did You Know: Is Tie-Dye An American Art Form? I could quite literally quote this entire article it's so interesting and well written. I'll leave the quotes to that, but how amazing to see how a pretty modern fad became a huge trend over trying to save a brand name product. In summary, basically the traditional methods, techniques and practices of the tie-dye movement from the 1960's and 70's we know of here in the USA were brought over from African traditional art to save a brand name. Amazing! Templates You Can Tie-Dye Yourself - Show me what you've got! Do you have a favorite template that works for tie-dye? Please share! 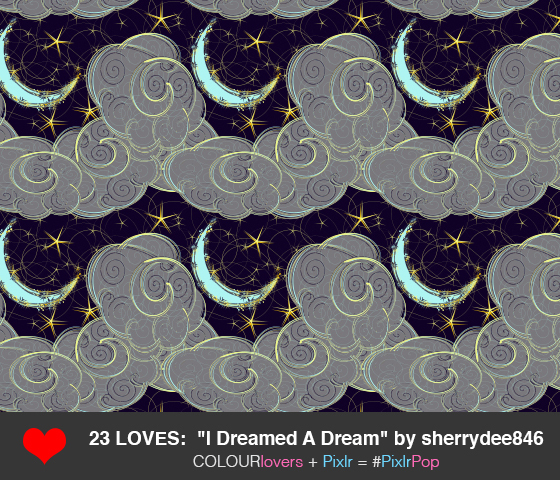 Inside out by DisneyPixar: Emotional Hues of COLOURlovers [ infographic ] + Mini Challenge! Disney•Pixar has outdone themselves (again) in their latest colorfully animated movie, Inside Out, directed by Pete Docter (who also produced UP and Monster’s Inc.) and coming to the big screen on June 19th! The basis of the storyline develops a genuine visual of feelings portrayed in five specific colors that correlate in to emotions. Who's excited?! I know I am! In leu of this extremely colorful production being explicitly about color in connection with feelings, we felt it appropriate to dig in to the collections COLOURlovers have in color. Much of the community here on COLOURlovers relate their communication of feelings in to colors both as a single color name or in palettes that speak either by the palette name itself and/or a message within the colors used to create the palette. Palettes can be defined of anything regarding 2 to 5 colors grouped together. For your entertainment, I love these video clips put together putting the actor-voices to the animated characters. I threw together an under 2-minute quick-guide video to the theme music of Inside Out. What's your color coordinated emotional palette and why? 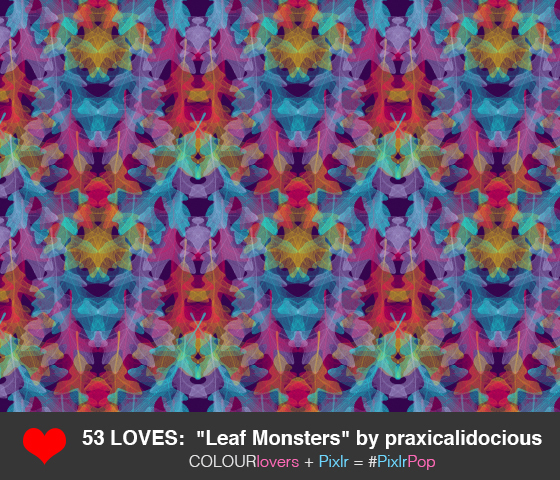 Jump in to the COLOURlovers Emotional Colors! 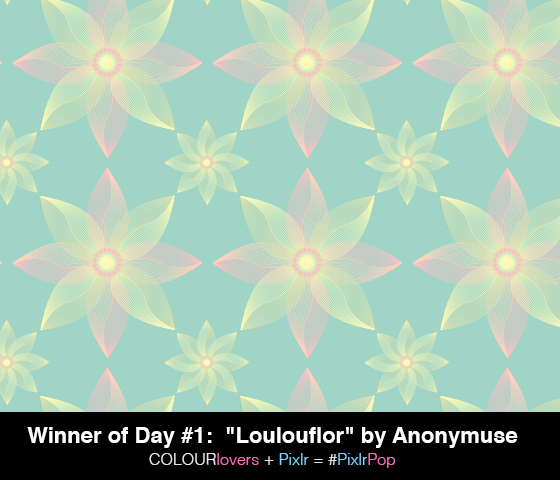 COLOURlovers + PIXLR #PixlrPop Contest Winners Announced! Today's the day! Announcing the eight (8) winners of the #PixlrPop Contest plus the top five (5) most faved designs by the community. 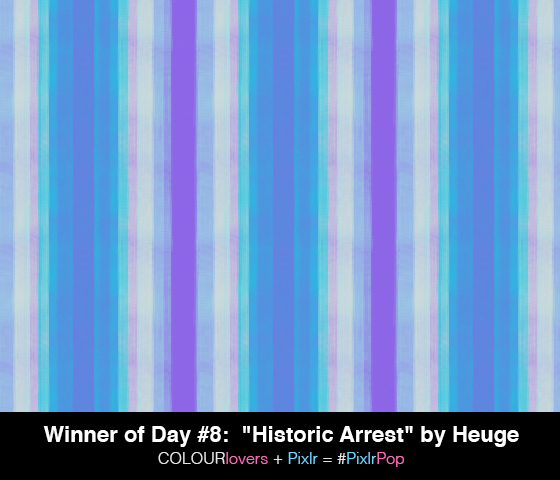 The judging panel consisted of the Pixlr Design Team and the COLOURlovers staff members (aka myself, Molly and Colin). Absolutely fantastic entries! Great work everyone! The flow of commentary throughout the contest days coming from the Pixlr Design Team was exciting to see. 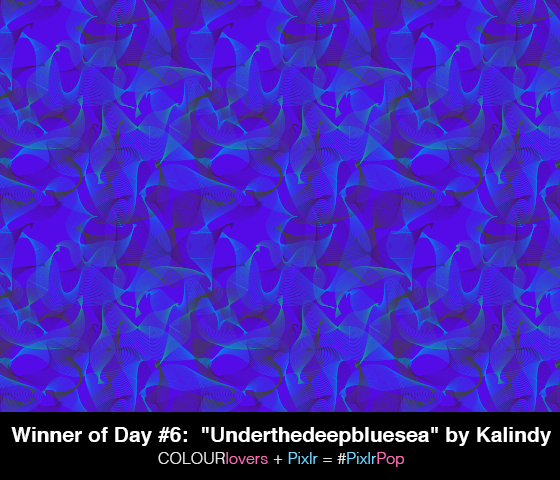 They expressed how amazed they were with the talent we have here at COLOURlovers. I felt a glow of pride knowing we have this secret gold mine of talented people in our community. I can't wait to showcase the final design inspirations near the end of June (coming up!) used within Pixlr Express! Okay, okay I know you guys are chomping at the bit to see the winners! With each winner the judging panel as a whole put together some commentary on the aspects of each design. "The soft colors, texture in the shapes and the windmill collectively make an eye-catching inspiration." "Fantastic shade of orange. The trendy arrow pattern inspires a hand drawn aesthetic - leaves many options to take from the shapes"
"Inspirational for light leaks and bokeh effects. Loving all the color choices with the layering." "This one strikes very lush with spring or summer coloring. Loving the texture with interesting layering. Inspiration leads to a beautiful field of flowers." "A subtle background coloring makes fantastic overlays. 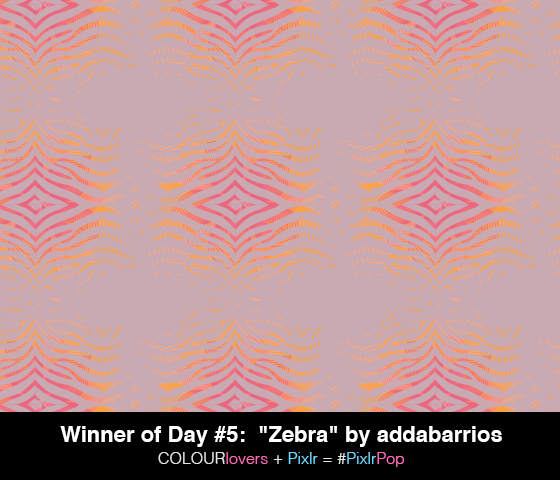 Combined with the non-traditional zebra pattern this inspires an intriguing piece." "This one gives us a subtle explosion of interest the longer we stare at it. We really love the rich depth of texture and pattern in this monochromatic scene." 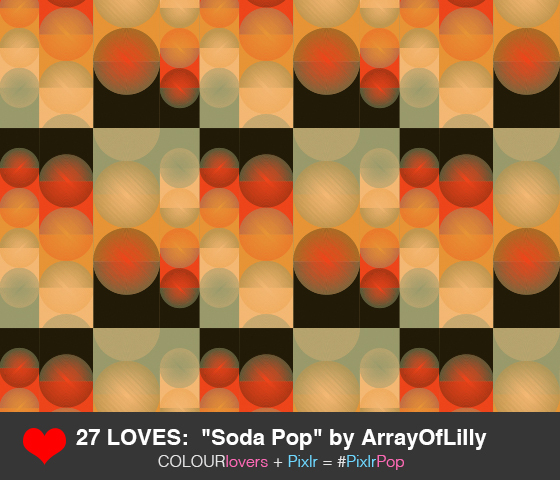 "This spicy pattern oozes with vibrant lava hues and terrific movement in the basic but intriguing tribal pattern play. Totally inspiring to see what we can do with it!" "An excellent spin on stripes giving off a soft, feathery feeling. The pleasant mix of hues bleed together in to a lovely muted visual. All of which might work nicely in an overlay." As you can see from the LOVES on each of these, none were selected by popularity (CL community vote). The judges took each day of submissions individually and considered many character traits of each piece as a whole to consider toward the design aspects of Pixlr Express. 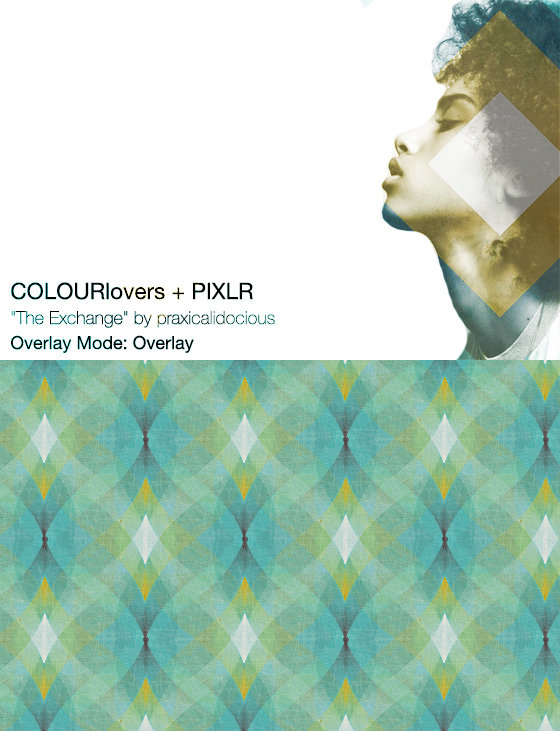 We will be showcasing the final pieces near the end of June (2015) when the COLOURlovers Expansion Pack becomes available to everyone using Pixlr! Exciting! 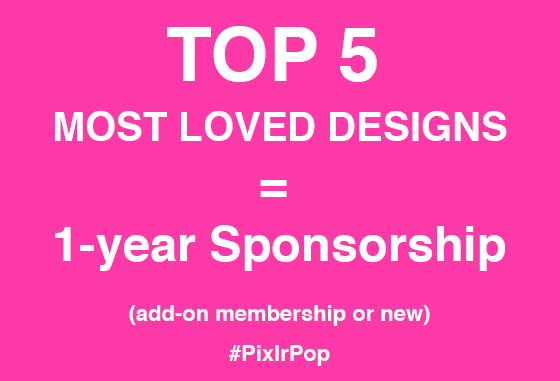 Top Five Loved Submissions: Sponsorship Winners! As promised, we wanted to add a little fun kick to those who just can't help but produce tantalizing designs that makes everyones mouse-fingers want to go click-click-click on that LOVE button! So popular vote or not, that's what these are for.... being popular. The LOVE-COUNT displayed is only for the duration of the contest timeline, as some have changed since Tuesday. That's it! I hope you all enjoyed the experience of this contest and can take positive things away even if you did not win. Trust me, there were a lot of difficult decisions in choosing! Personally, I feel that contests push me to a different level of motivation in my own skills which contributes to how I view where I am in my skill much longer after a contest is held. I notice area's where I could probably work harder or think directionally different and garner some personal advice from the designs that did win. We quite literally could have chosen over a thousand designs we loved, but in the case of contest critique, it comes down to a hard line. Grab Bag Winners: You will be receiving either a Love Note and/or an email (whatever email is associated with your COLOURlovers member account). In this message you will get links to all the Grab Bag Items we had pictured and linked here in the contest post. Messages will go out today at some point, you will be given a certain time period to make your choice (feel free to reference the original contest page to start shopping early!). Colin will be handling prize notification and placing your order/choice. Sponsorship Winners: Today we will activate the new or upgraded Sponsorship to your COLOURlovers Member Account. If you already have a paid sponsorship active, we will simply add an additional year to your current expiration date. COLOURlovers on YouTube: Pattern Design in Seamless Lite and Other Great Stuff! Seamless Lite at COLOURlovers is something many people shy away from, but hopefully after some inspiring short video clips, most of you will start to gain some perspective on how to get a design you're proud of. Check out our YouTube Channel! While the bulk of the video's I've been preparing are centered around using Seamless Lite, there are the intro video's to palette making and I will add more fun abstract videos weekly. After my 8-minute intro video regarding more details on the Line Tool itself, I have added a collection of video's in high-speed of certain design styles to show you the process. You will hopefully learn how to layer for dimension and layering to create visual tricks. Overall just using what we have available in Seamless Lite is not as limiting or as complicated as you might think. I want to point out some further resources that I personally tend to lean on for getting inspiration on what to draw exactly. I find if I just plop myself in front of Seamless Lite I feel vacant and suddenly all those idea's I had are not there and I draw a blank. Viable search terms include:Quilt block design (key to put "quilt block"), embroidery patterns (be sure to include the "patterns" part of this search as you'll get step by step instructions) and then, Zentangle Patterns and/or Zentangle Tutorials to get you more specific guides. Look at each topic matter and you'll start to notice a design style you like. If you love geometric bold patterns, Quilt Block Designs are your go-to. If you love the organic artistic design style, both Embroidery and Zentangle are a great start. You can find these and more, on my Seamless Lite - Inspiration Guide (on Pinterest). Check out this example of following a step-by-step Zentangle pattern, essentially just taking Zentangle to Seamless Lite! Most of them are doable! Cool right?! 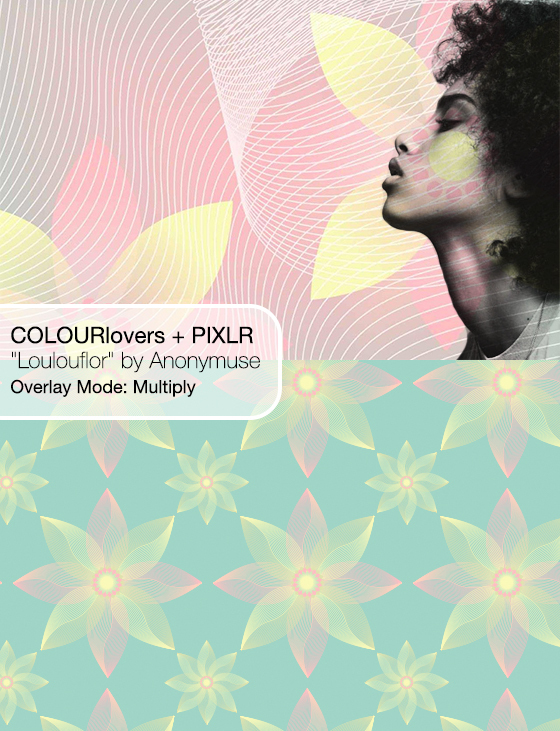 Now let's look at some COLOURlovers Seamless Lite video's I recently made. The biggest thing I want to emphasize in this video is the process of wisely using your time. If you're like me and you don't have 8-hours to sit around making a pattern, split up your time by developing core Custom Shapes and design elements then later coming back to work on your design layout. You'll thank me later when you can easily go in to your shape library with a fresh frame of mind when it comes to the pattern layouts. I hope you enjoy the quick bits to music. They are much faster to watch as patterns come together. I hope it's helpful! 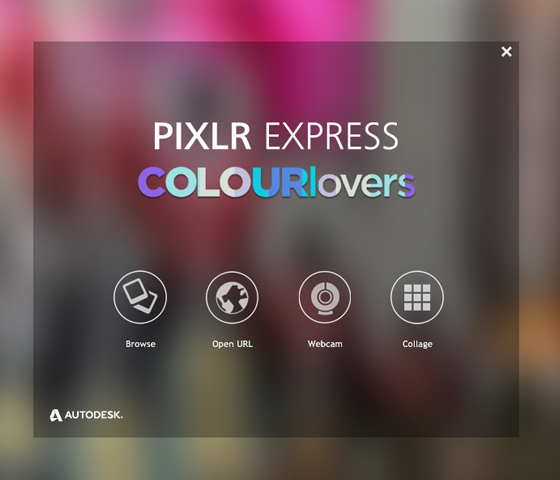 Pixlr Express is making a COLOURlovers Expansion Pack! This is going to be a such a fun and unique contest open for all talent-types utilizing our very own familiar tools. If you're crazy impatient and want to skip further reading, go here to submit designs right away! 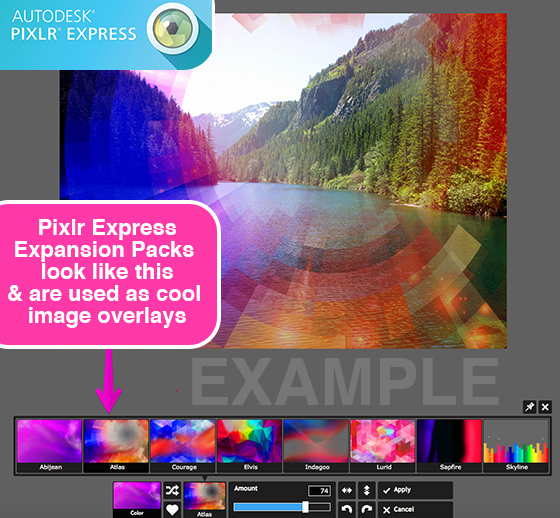 A Pixlr Expansion Pack is used in photo overlays, borders or stickers in their impressive and fun photo editing apps. Remember to use #PixlrPop on social media to tag and follow the fun! 1. A Pattern Template (one or more)... specifically, one you made. 3. 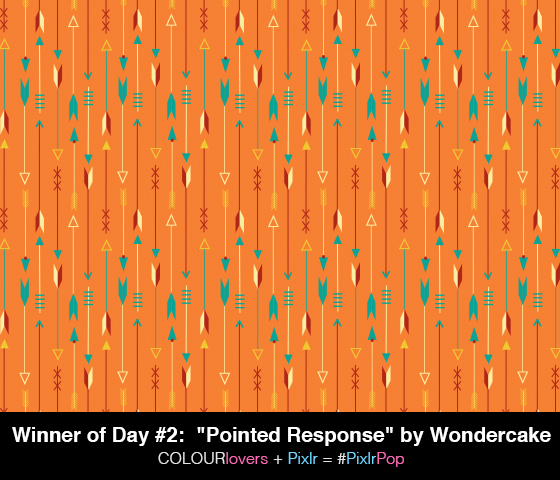 After you've gotten a collection of bright and powerful colored patterns ready to submit, head on over to the Contest Submission Page and submit like crazy (every day). I have made some tutorial video's over the past couple weeks, however, they go in to a lot of detail, so don't worry, I've thrown together a CRASH COURSE to jumpstart and survive the contest! 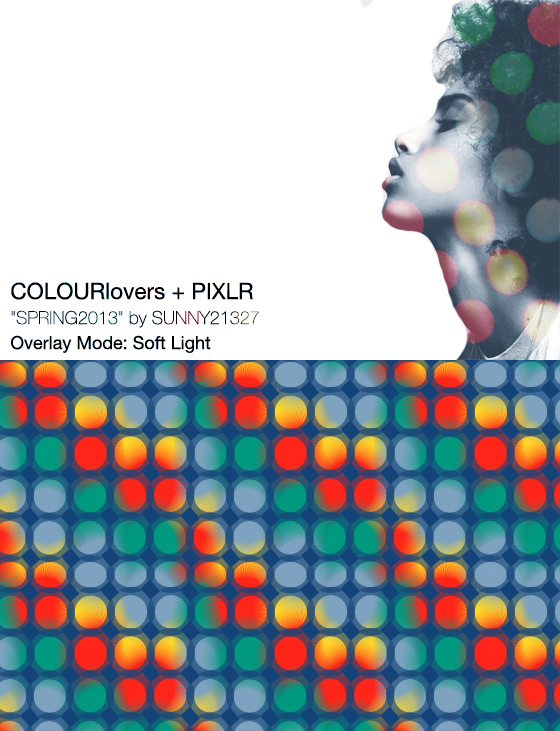 If your design is chosen (aka you win), it will be used to inspire the Pixlr Design Team's choices in the development of the COLOURlovers Expansion Pack as a photo overlay, border, or sticker. 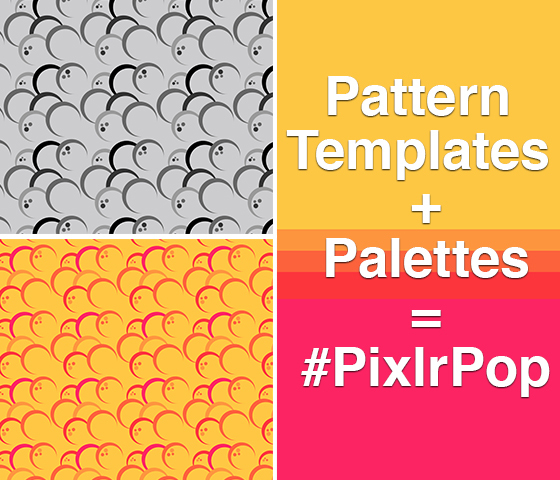 These are design elements used throughout Pixlr apps, but more specifically you'll get to see them available on Pixlr Express (for free!). Pretty exciting! Eight (8) Winners! Check out how the winners-scale works! 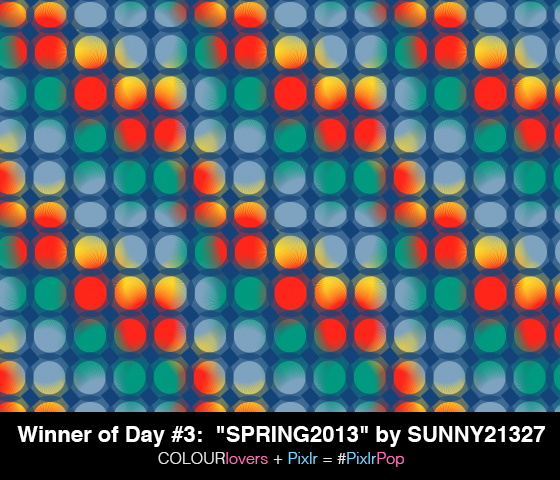 This is something more unique to the COLOURlovers contests. I personally love the concept Colin has put together because it allows more overall opportunity. This means each day of the contest is an opportunity to win something (you can only win once throughout the entire contest). It will not matter what time of each day you post, between 12:01am to 11:59pm PST (with the exception of the start and end dates) because the submissions will be randomized in a filtered gallery for the judges panel. Community LOVES will still be available on submissions, however this filter is not displayed to the judges at choosing time, nor will it affect decisions in the slightest. We did want to do something fun with the community loves so we'll be giving five (5) Sponsorship 1-year level-up or extensions to COLOURlovers members design submissions with the most Loves. *You may only win once in this category. The prizes are a non-branded gift this time around. Each winner will get to select from our grab bag of fun prizes! Colin has rounded up all sorts of crazy fun prizes that any human should find fun to choose from. Winners will have a set timeframe to choose their prize after winners are announced so that we can ship them all out at once so make sure you are checking your email and will be available post-contest. 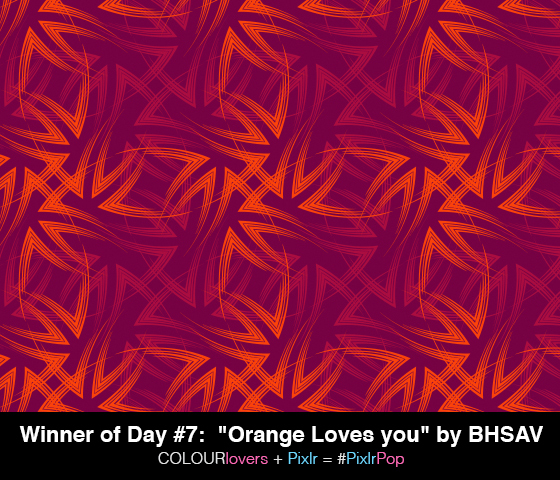 Only patterns that you have both designed and colored can be entered into the contest. You may enter as many times as you like each day! Submissions from the previous day will not roll over in to the following day, so make sure you are submitting a fresh set each day. Submissions open from May 19th at 9am PST and close on May 26th at 5pm PST. One winner will be chosen each day by a panel of judges at Pixlr.com and COLOURlovers.com employees (Pixlr Design Team Members and Colin & Molly). Dates 05/19/2015 - 05/26/2015. Click here for official rules. COLOURlovers Creative Series: Seamless Lite Getting Started, Coloring A Pattern & Pixlr Contest Announcement Leaked! Continuing with our blast of the COLOURlovers Creative Guide Series, I bring to you today a video for Getting Started with Seamless Lite, the online seamless pattern template designer here at COLOURlovers.com. I've gone over each piece of Seamless Lite to give you a base overview, then I delve in to using each of the tools and add some good sanity-saving tips and tricks to get the most out of your first experience using the template designer. Be sure to save pieces of your design as custom shapes in different states - often. Know that you cannot SAVE your template and come back in to Seamless Lite to EDIT that template. Editing at template only gives you informational edits such as name, description, tags and groups. Saving Custom Shapes that make up your full template, ensures you can more easily go back in and re-design a template without having to start from total scratch. Trust me! Watch the Getting Started with Seamless Lite [ VIDEO ] here! Don't overthink making a template! Stick with geometric ideas to get yourself started. 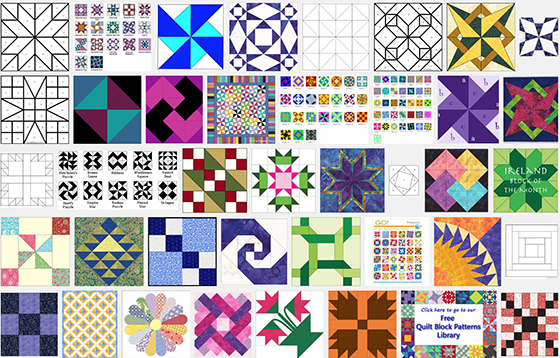 My BEST TIP for getting pattern idea's is to google, "quilt block patterns" and check out the many images that are made from extremely simple shapes, but make up extraordinary design concepts, especially when repeated - much like a quilt. I cover how to color a pattern basics, plus a great trick to coloring better. Then I cover how to apply a certain palette to a pattern template. Wow it's really here! NEXT WEEK - We are bringing you a fun and easy contest with a very simple idea that everyone can feel confident contributing to. Pixlr will be the focus and brand we are partnering up with for this fantastic color inspired event!! You will not have to know any Pixlr knowledge, this is an inspiration-project for them more based on how your colors in a palette work together. More information to come next week on that. We will have prizes and multiple winners! Prizes are not brand-specific but a vast array of items any human would love to have worth $100 value (range). I am not going to go in to all the details today, however, I will say that you will want to know the basics of pattern template making - for real - absolute basics (make a triangle).... and you will want to know how to make a basic palette but you are more than welcome to utilize the more robust features of COPASO to create stunning blends for this as well. 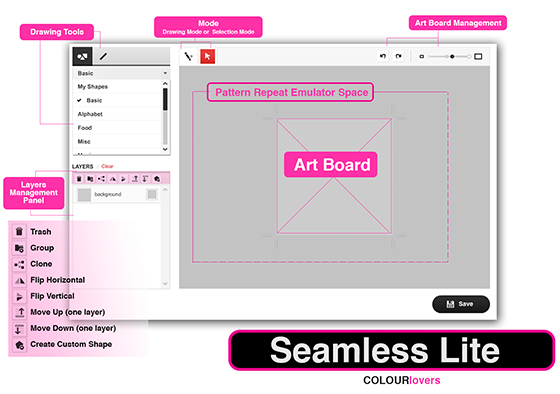 Work with Seamless Lite - The template itself is not being judged, it's simply a way to display and show off your palette.